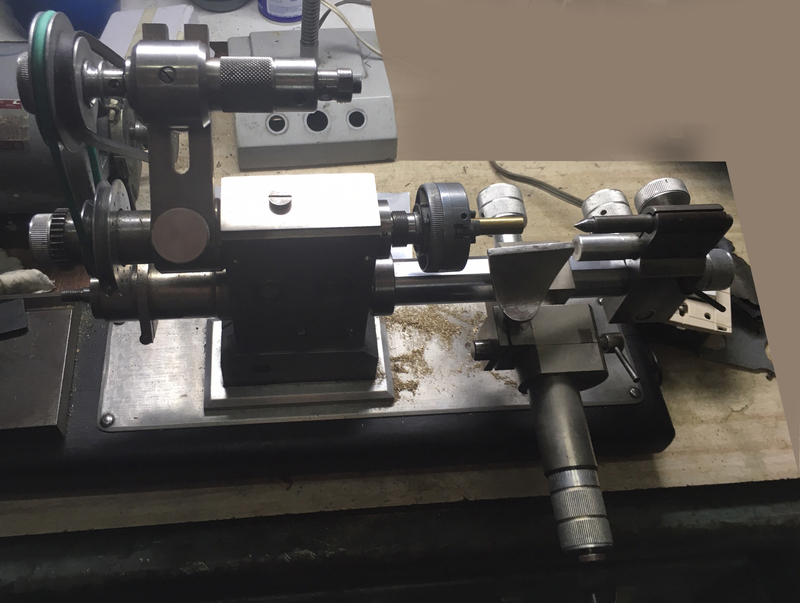 Of a highly unusual (possibly unique) configuration this 10 mm watchmaker's lathe appears to have a round bed that can be moved in and out of the headstock casting. Just visible in one picture is a short section of rack machined into the top of the bed - the drive gear being fitted to a handle mounted on the front face of the headstock. 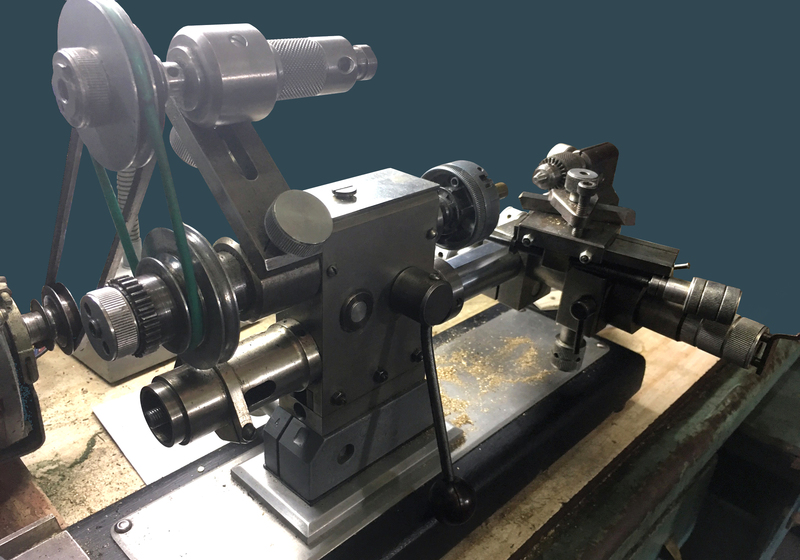 Other odd features for this class of lathe include a screw-driven cross-slide made from a thick-walled tube that sockets into a block clamped to the bed, together with a tool-slide that can be both raised and lowed in its supporting block - and that block rotated about the cross slide. 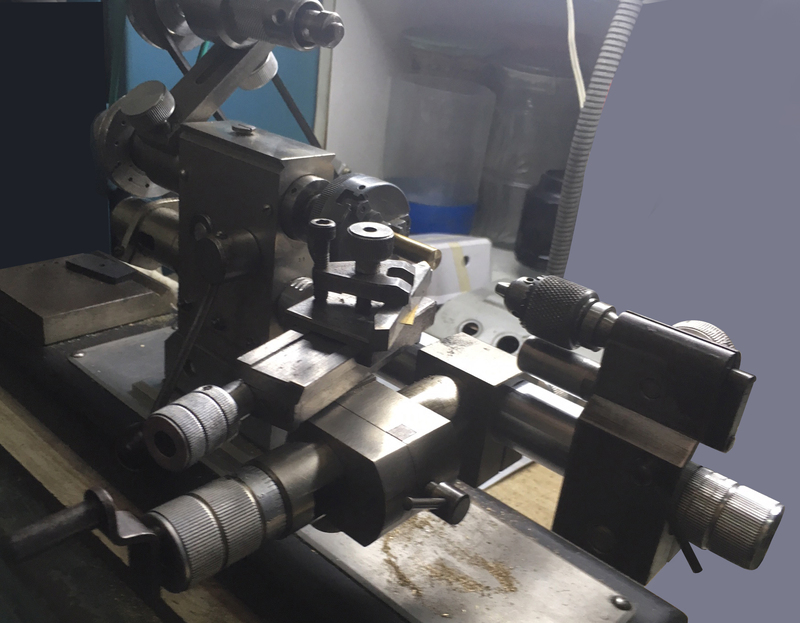 The result of the arrangement is whole assembly - cross and tool-slides - is able to be rotated around the bed and so the cutting tool placed in almost any position and fed from any direction. In addition, the various handwheels and micrometer dials are all formed as cylinders knurled for most of their considerable length. Drive is arranged from the rear-mounted motor via a 2-step pulley to a simple countershaft carried on a slotted arm bolted, at an angle, to a boss that forms a sleeve over the outside end of the headstock spindle. A further 2-step drive takes the drive to a pulley overhung on the end of the headstock spindle. This is a clever arrangement - for, simply moving the countershaft bearing housing up and down the slot (it's held in place by a knurled-edge locking screw) both drive belts are slackened simultaneously to allow changes of speed. Fitted to the end of the spindle is a gear and, below it, the end of the bed is bored and tapped with a large-diameter thread and its end turned down over a short length Might a power-feed mechanism have originally been fitted, with a banjo arm clamped to the section of reduced diameter? From its general appearance, the possibility exits that lathe might be a one-off, "home-made" special, for its design and construction - with parts consisting mainly rectangular, square and round pieces of steel - would certainly not have been beyond the ability of a skilled machinist working in a reasonably well-equipped workshop.